Grilled Baby-backs- a few styles. Now that I can assume the weather should stay moderately warm, I can say grilling season is here to stay. 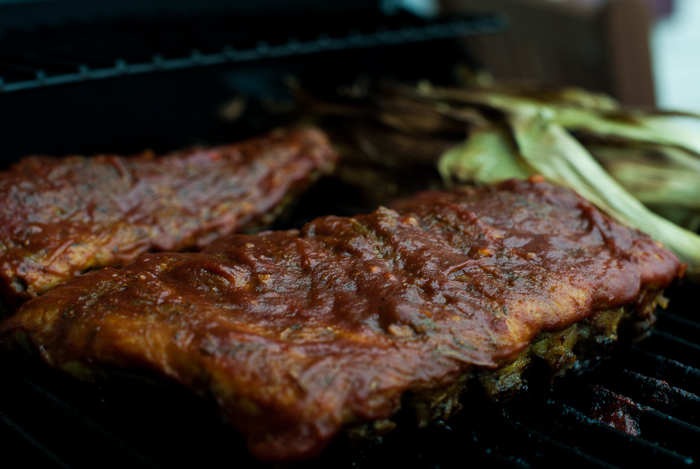 I can then say it has been fun doing some experimenting with different ways of preparing baby back ribs for the grill. For the first round, I prepared a dry rub of red onions, garlic, salt, pepper, sweet peppers, rosemary, chili powder, brown sugar, and scallions. I placed the rack on a sheet pan and poured a little whiskey in the bottom, foil-wrapped, and left in the refrigerator for two days. After two days, I then started off by slow cooking the pan in the oven at 200 degrees for 2 hours. 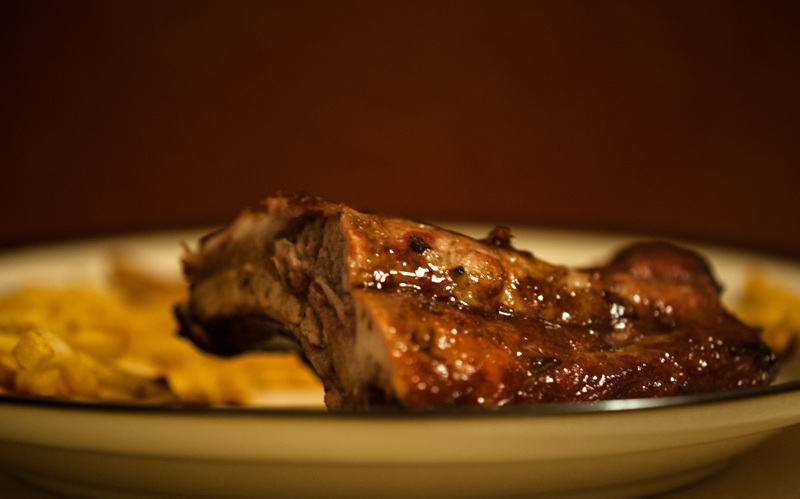 I then put them on the grill and used a homemade sweet-tangy barbecue sauce which I did in two coatings. The side of corn I soaked the husks and basted the corn with a mixture of oil, balsamic vinegar, salt and pepper. For the second round I started off a little differently. I used some of the same spices as with the first time, but then I turned it into a moist rub by the addition of finely dicing up some pineapple and mixing it with some tequila. I then also added some tequila to the bottom of the pan. I did a similar cooking prep except I turned the oven to 180 degrees instead of 200. I also did a lighter addition of barbecue sauce (same kind but I added some more smoky elements and chili powder to offset a little more with the sweetness of the rub). In this instance I decided to make some homemade fries (which I cooked in the oven at 380 degrees). I cut the potatoes up into strips, lightly basted them with some olive oil and used some salt, pepper, diced up garlic and scallions and baked. Upon completion, I tossed them in some truffle-infused oil and served. Overall, both cases for preparing the ribs were a success. I felt the moister rub (and possibly the slightly lower oven temperature) left a slightly moister rib when fully cooked/grilled, but at the same time I love having that thick, partially starting to blacken sauce on my ribs. In the end, can’t go wrong with either route. 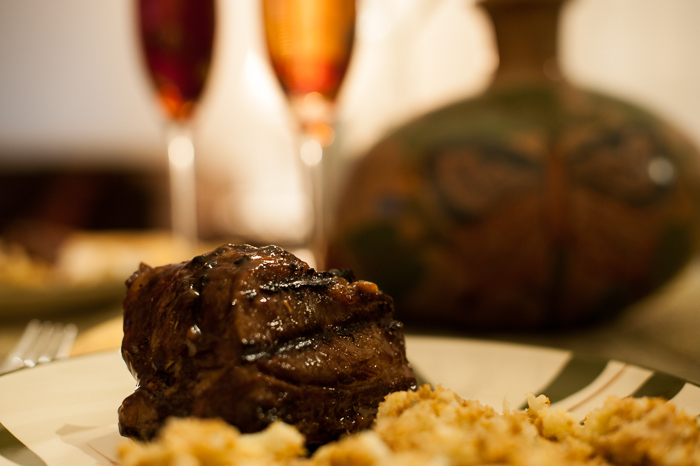 Just wanted to share some Asian-style short ribs I had made a few days back. 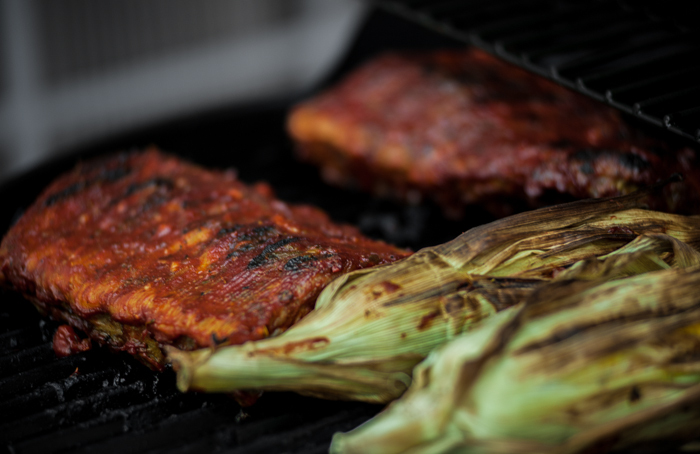 The ribs were intitially done with a dry rub including ground up garlic, chile powder, scallions, and salt. I made a soy-garlic-ginger reduction which I then basted on the ribs while they were cooking on the grill. Served with a side of breaded cauliflower. Baby Back Ribs Done in the Oven. Every so often I tend to get a craving for something I have not had in quite a while: could be due to scarcity of a product, seasonal/weather related issues (as in this case), or price/time constraints. 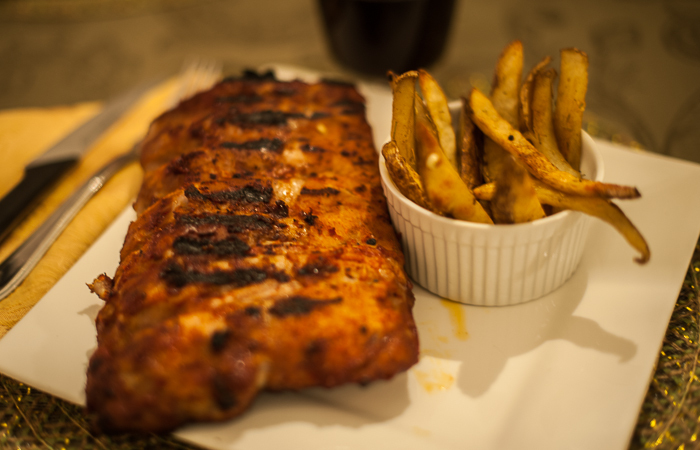 I was in the mood for some baby back ribs, so despite cold winter weather, I created a nice indoor version. A day ahead, I had made a marinade of brown sugar, soy sauce, ancho chili, and some soy sauce. I put the rubs in a ziploc bag and left in the fridge overnight until the next afternoon. 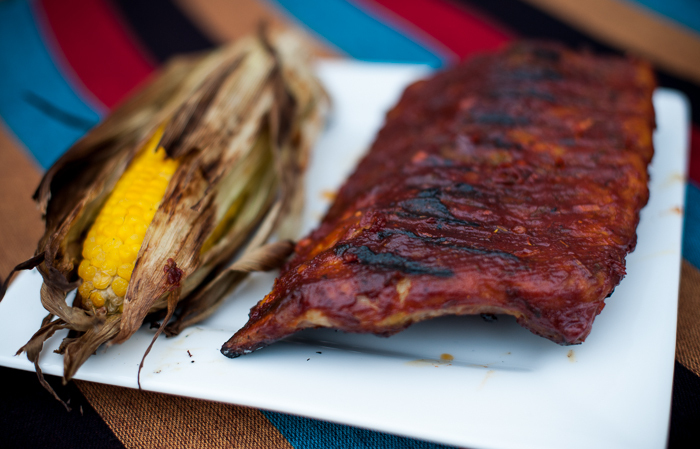 I set the oven to 450 and prepped the ribs by placing them on cooling racks over a sheet pan. I then cooked them for 20 minutes with the curved side upwards. In the meantime, the extra marinade I put in a small saucepan and added some fresh ginger, garlic, and a little corn starch. I then heated lightly until it started to boil, added in some ale and let simmer until it reduced to a nice consistency like bbq sauce. After the initial 20 minutes in the oven, I then took the rack out, basted the ribs on the same side and put back in for about 10 minutes. I then flipped the ribs over, coated the other side and cooked for another 15 minutes. 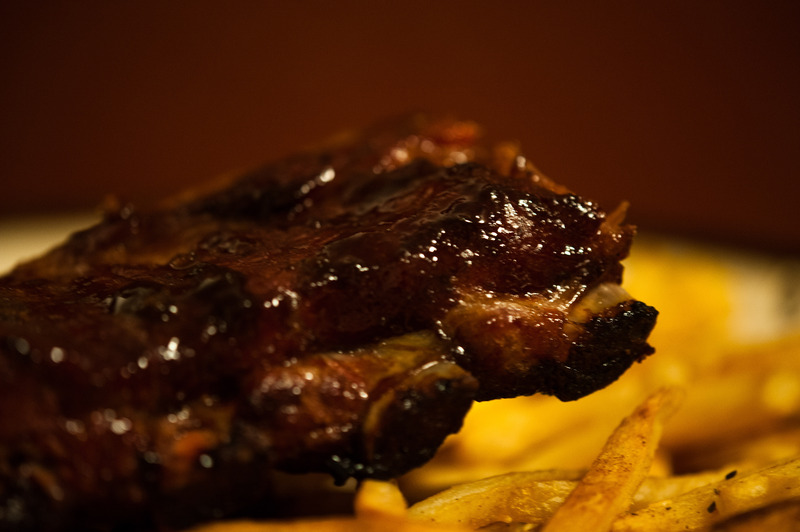 Nice sticky glaze, tender juicy ribs. A nice side of seasoned fries. I am now past the halfway point of the first week of my new job as a chemist at FujiFilm down in Delaware. The days are not too overbearing however until I either finish training and go on normal shifts or move in the fall. besides work I also have a decent sized commute. These factors as well as others will dictate a little more of what I will be cooking and eating- become a little more practical in the sense of easy cook or things with nice pre-prep (i.e. evening before) as well as potentiality of left-overs, i.e. next day lunch. For this one I did some beef ribs. I was doing some food shopping last night and was looking for some different ideas and I came across beef ribs (racks are similar to baby backs but instead of pork are beef). I bought a package (typically two rack pieces) and took one section and cut up the ribs individually. I made a sauce/marinade blend consisting of tomato paste, pinot noir, chili powder, and other various spices. They were all mixed well in a pot and sat in the refrigerator over night. This pot in the evening was then put in the oven at around 300 degrees which then gave me time to prep side dishes. 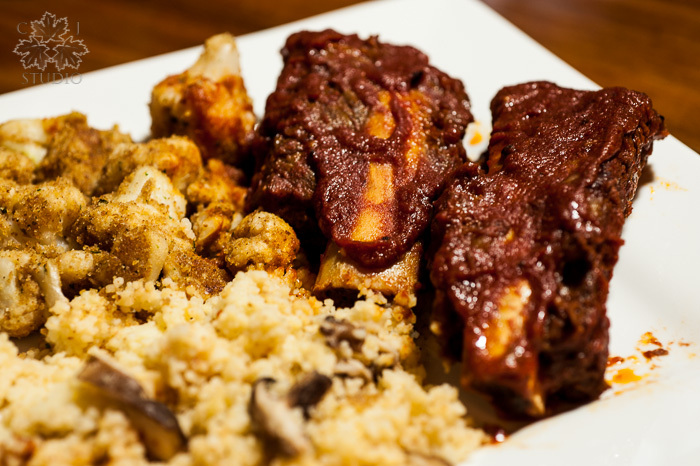 Tonight I did fried/breaded cauliflower and from an earlier meal had couscous with shiitake mushrooms and various spices. The nice thing was the cooking time in the oven gave me time to get the wash on and in the dryer and then by the time everything all done and cleaned up time to get all the laundry. 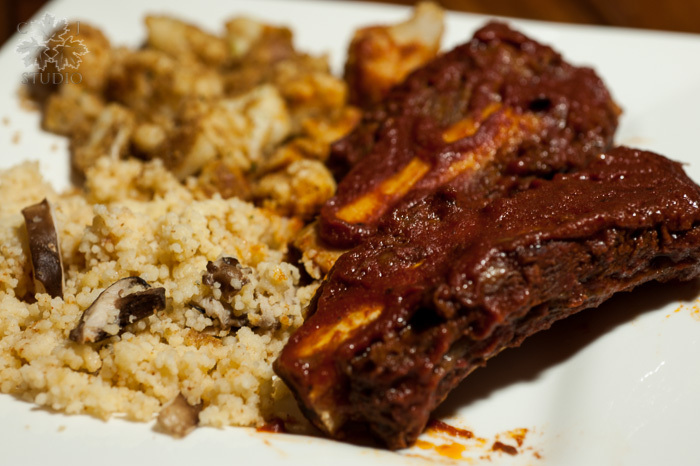 It was simple enough cooking where I have extra ribs and cauliflower which will now be a weekday lunch while at work. Simple, tasty, practical.